Girona work the corner short. The ball is passed to a nearby teammate. The referee stops play so that a substitution can be made and Wissam Ben Yedder trots off the pitch and is replaced by Guilherme Arana (Sevilla). Nice touch by Pablo Sarabia (Sevilla) as he latched on to an accurate cross and attempted to direct the ball with a fine header towards the net, but the goalkeeper reacted quickly to keep it out. A yellow card for a tackle by Pablo Sarabia (Sevilla). Guillermo Cuadra Fernandez doesn't hesitate at all to make this decision. Sergio Escudero goes off the pitch and Quincy Promes (Sevilla) comes on. Portu (Girona) is unable to control an accurate defence-splitting pass properly and one of the defending players reacts well to rob him of the ball. Guillermo Cuadra Fernandez shows a yellow card to Ever Banega (Sevilla) for a tough tackle. That was close by Roque Mesa (Sevilla)! He receives a pass on the edge of the box and shoots, but the ball goes by a whisker over the crossbar. Alex Granell comes onto the pitch after Seydou Doumbia (Girona) signals to the bench that he cannot continue any longer after picking up an injury. The game is interrupted now, Seydou Doumbia (Girona) picks up a knock and the physio has to come on. Pablo Machin is forced to make a change. Simon Kjaer (Sevilla) is not able to carry on due to injury. 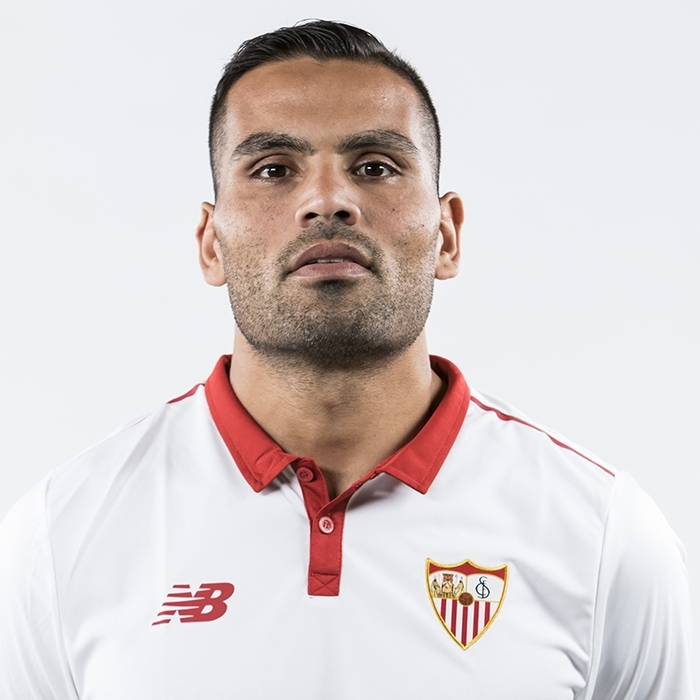 He is replaced by Gabriel Mercado. Simon Kjaer (Sevilla) requires medical treatment, so the referee stops play and signals for the physio to come onto the pitch. Portu (Girona) swings in a cross, but the ball is cleared to safety by one of the defending players. That's unlucky! Sergio Escudero (Sevilla) beautifully controls a pass and from the edge of the box drills a shot in on goal, but it's inadvertently blocked by a defender and cleared. Wissam Ben Yedder (Sevilla) gets into a great position in the box after a pass, but sends his shot just wide of the left post. Wissam Ben Yedder races towards the box before laying off to Sergio Escudero (Sevilla), who picks it up but blazes a shot well over the bar from the edge of the box. Wissam Ben Yedder (Sevilla) fires a shot high over the bar from inside the box after latching onto a short pass. Seydou Doumbia (Girona) picks up a long through ball, but Tomas Vaclik deserves praise for a brilliant reaction and interception. Eusebio Sacristan decides to make a substitution. Valery Fernandez will be replaced by Seydou Doumbia (Girona). The resulting set piece from Sevilla is comfortably intercepted by one of the defending players. Jesus Navas (Sevilla) tries to send a pass but it's blocked. The ball goes behind for a corner. Sevilla will have an opportunity to threaten the opposition's goal. Guillermo Cuadra Fernandez blows his whistle as Sergio Escudero (Sevilla) used excessive force in the tackle during an attack. Borja Garcia (Girona) wastes a good opportunity as his pass into the box is blocked by the defence. Goal! Pablo Sarabia (Sevilla) finds himself some space inside the box to get on the end of a pass from Wissam Ben Yedder, then sends the ball into the bottom right corner. 2:0. Andre Silva (Sevilla) probably handled the ball. We are about to witness a substitution. Aleix Garcia (Girona) is replacing Douglas Luiz. Pablo Sarabia (Sevilla) takes a great touch after receiving a pass inside the box. He immediately unleashes a low shot to the middle of the goal, but the keeper pulls off a decent save! The free kick from long range, taken by Girona, is intercepted by one of the defenders. Wissam Ben Yedder (Sevilla) tries to latch onto a defence-splitting pass, but one of the defending players intercepts the effort and the danger passes. Goal! Ever Banega (Sevilla) wins the battle of wills and sends an unstoppable penalty past Gorka Iraizoz into right side of the goal. Ever Banega (Sevilla) is heading towards the penalty spot to take it. Juanpe (Girona) was too forceful with his tackle and Guillermo Cuadra Fernandez interrupted the game to signal a free kick. Sevilla are about to take a penalty! Sevilla take a short corner kick. Douglas Luiz (Girona) collects a wonderful lead pass and as he has a lot of space, smashes a terrific shot from long range. His shot goes painfully close to the crossbar! The players claim that Pere Pons (Girona) handled the ball and it seems they are right. A cross from a mid-range free kick, taken by Girona, is intercepted by one of the defenders. It looks like Daniel Carrico (Sevilla) saw red with that tackle. Guillermo Cuadra Fernandez won't tolerate such behaviour on the pitch and blows for a foul. Girona have been awarded a free kick. The attendance for today's match is 33542. The whistle blows and Guillermo Cuadra Fernandez starts the second half. Sevilla have a chance to score from a corner kick, but the ball is cleared by a defender. Sevilla quickly take a corner kick with a short pass. Roque Mesa (Sevilla) latches on to a precise pass and finds himself one-on-one with the keeper. He fires a low shot towards the left side of the net, but Gorka Iraizoz leaps like a salmon to deny him. It will be a corner kick for Sevilla. Andre Silva (Sevilla) fails to send a pass into the box as his effort is cut out. Wissam Ben Yedder (Sevilla) produces a lovely ball into the penalty area but the defender manages to intercept and comfortably averts the danger. Roque Mesa (Sevilla) sends a pass into the box, but his attempt is thwarted and cleared. Pablo Sarabia (Sevilla) is obviously not following the Golden Rule: „Treat others as you want to be treated.“ He makes a bad challenge and leaves Guillermo Cuadra Fernandez with no other option than to blow for a foul. Wissam Ben Yedder (Sevilla) passes the ball onto Andre Silva, but one of the defenders dispossesses him. Valery Fernandez (Girona) can't expect anything else than a yellow card for his hard tackle. And a yellow it is. Guillermo Cuadra Fernandez didn't think twice about pulling it out of his pocket. Pedro Porro (Girona) sends over a cross, but he can't find any teammate inside the box. Poor delivery. Excellent touch by Pablo Sarabia (Sevilla)! He latches on to a precise pass deep into the box and produces a low drive towards the right post. The goalkeeper pulls off a beautiful save to deny him. The referee blows his whistle, Sevilla are awarded a corner kick. Guillermo Cuadra Fernandez blows his whistle and it's Christian Stuani (Girona) who is penalised for an offensive foul. Good decision by the referee. Sergio Escudero (Sevilla) fashions a shot from the edge of the box after receiving an accurate pass. Gorka Iraizoz makes a comfortable save to stop the effort from flying into the middle of the goal. The game is interrupted at present as we wait for a free kick from 30 metres out. That's quite a promising distance for Ever Banega (Sevilla) so let's see what he's capable of. The resulting set piece from Ever Banega (Sevilla) is successfully intercepted by the defender. Dangerous play by Christian Stuani (Girona). Guillermo Cuadra Fernandez blows his whistle for a foul. Sevilla win a free kick. The ball flies way wide of the left post as Ever Banega (Sevilla) produces an imprecise volley strike from long distance. Daniel Carrico (Sevilla) does well to dispossess the attacker with a slide tackle, but the referee blows his whistle for a foul. Girona didn't take advantage of the corner and score as the opposition's defence was alert and averted the threat. Portu (Girona) fails to find any of his teammates inside the box as his pass is blocked. The ball is out of play and Girona manage to earn a corner. Roque Mesa (Sevilla) sends a cross into the box, but the opposition's defence quickly intercepts the ball. Pedro Porro (Girona) is unable to feed a through ball into the path of his teammates. The ball goes out of play and Sevilla will have a goal kick. The Girona players keep the ball and are exchanging a combination of passes. They are waiting for gaps in the defence to open up. Jesus Navas (Sevilla) tries to find the head of a teammate in the box but overhits the cross. Douglas Luiz (Girona) received a pass out of defence and immediately attempted a long-range shot, but a defender bravely blocked the effort. Jesus Navas (Sevilla) once again attempts to send a defence-splitting pass, but the opposition's defence is alert and intercepts the ball. Andre Silva (Sevilla) is picked out by one of his teammates with a brilliant long-range cross, but he doesn't control the ball well and the defence eliminates the danger without any problem. Golden chance! Wissam Ben Yedder (Sevilla) meets a cross in the box and finds some space for a shot. He produces an inaccurate effort that goes wide of the right post. Sergio Escudero (Sevilla) commits a foul on his opponent and it looks like it should be the other way around at first glance, but the referee makes the right decision in awarding a free kick to the other team. Direct free kick. Borja Garcia (Girona) attempts to beat the opposition's defence with a fine lofted pass into the penalty box, but one of the defenders reacts well and averts the threat. Guillermo Cuadra Fernandez couldn't ignore the rough tackle by Simon Kjaer (Sevilla) and blew his whistle. Girona have a free kick. The defence had a hard time blocking out the strike from Borja Garcia (Girona). He didn't hesitate and finished from outside the box right after he had received a pass from his teammate. Girona take the corner, but their hopes of scoring a goal end with nice clearance by the defence. Borja Garcia (Girona) tries to slide the ball through to a teammate but it's well blocked by a defender. The referee signals a corner kick to Girona. Portu (Girona) slides a pass forward, but one of the defenders cuts it out. The players are on the pitch and Girona will have the kick-off. Guillermo Cuadra Fernandez will referee today's match.